5778 – The year of redemption or the year of the capstone. It seems the focus is all on 5777. If you haven’t read the article on 5777 then you can right here (https://m.facebook.com/story.php?story_fbid=1088331331276418&id=519754571467433). But you have to remember, if you tend to think like I do, I believe there is a very negative spiritual thing going on with the Sept 23, 2017 sign. If this sign is truly false like I believe, then whatever it is that is being birthed that day, is now in its gestation period. Here is the kicker though. Everyone is looking to 5777 but 9/23/17 actually falls on the third day of 5778. The jewish new year falls on 9/21/17 this year. Is the third day of the year have any significance? Yes it does, Jesus rose from the grave on the third day and the 3rd day, our Tuesday, was the only day that had a double blessing during creation. Let’s look at Genesis 1. Here we see a few things. The water was separated from the land and for the first time we see Earth. Prophetically this makes me think of Rev 13 and the beast of the sea and the land. There was a separation between the kingdom and their “king”. We also see the earth brought forth grass and seed. This brings me back to Rev 9 where the locusts aren’t to harm anything green and those that are sealed by the Spirit of God. These are just a few thoughts on Jupiter leaving Virgo on the third day of 5778. But is there more significance to 5778 in relation to the Jews looking for their “messiah”? Let’s take a look. I’ll first point out that the Hebrew year 5778 coinciding with 2018 on the Gregorian calendar is significant. It was in the year 2018 BC (or AM) that God made the first covenant with Abraham. (AM = Anno Mundi, or years since creation). This was 70 years after Abraham’s birth in 1948 BC (AM). Then we see the new independent state of Israel was established by the UN in 1948 (Gregorian calender), so 2018 will also be 70 years (or a generation, see Psalms 90:10) since then. Pretty interesting right? 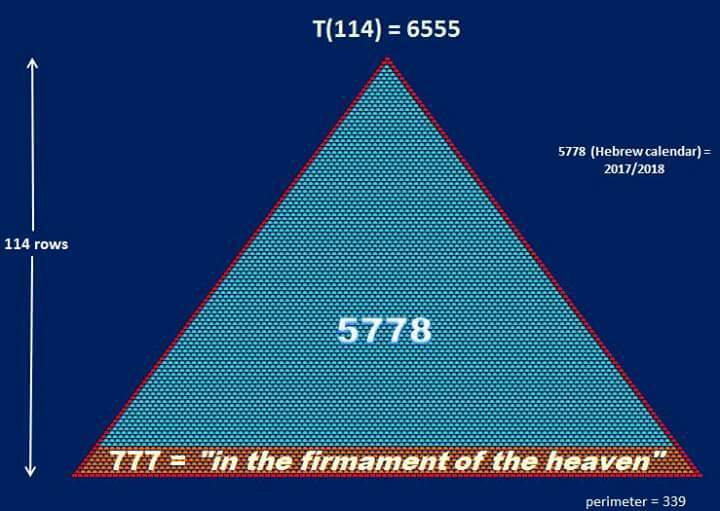 Kabbalists have what is called the 5778 triangle. I want you to notice the numbers they use. 18 (6+6+6=18), 153 (i did a paper on the connection to the 153 fish the disciples caught which represented the end time harvest and a possible connection to Rev 9) and 1088 (10 representing a kingdom and 88 representing the gemini twins/twin pillars). 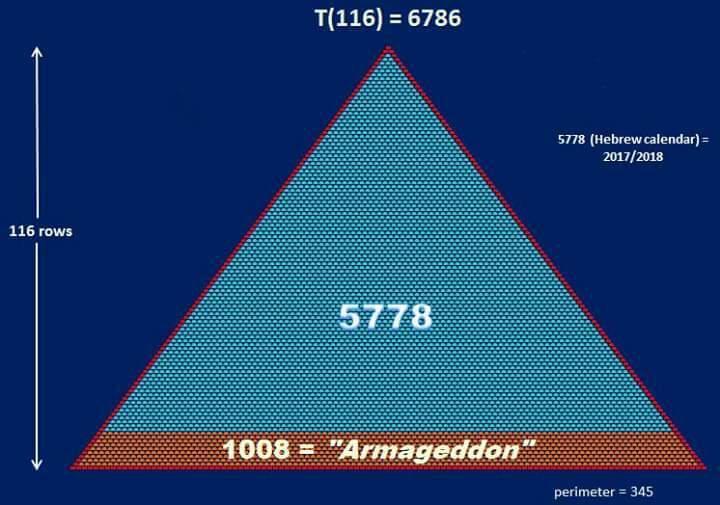 “The significance of number 18 can be appreciated when the 5778 triangle is deconstructed into 18 segments. It can be seen that the Genesis 1:1 triangle (and its constituent parts) together with the mysterious triangular number 153 figure prominently in the 18 piece 5778 jigsaw. The overall picture is a tolerable illustration of the miraculous catch of fish outlined in John 21. 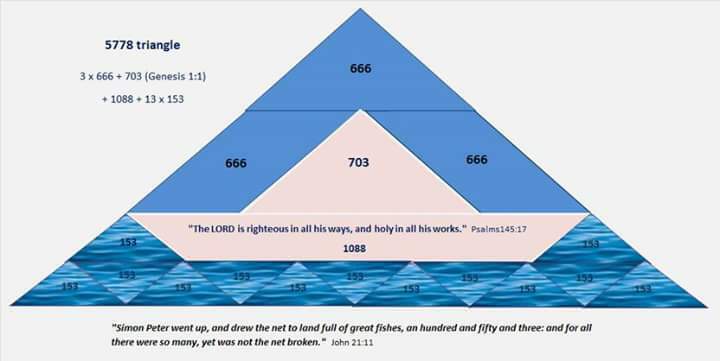 The three pieces representing the sky total 1998, which is the gematria value of “In the beginning God created the heaven…” from Gen 1:1, whilst the 1088 trapezium (the boat upon the waters) matches the gematria value of Psalm 145:17. Here are a few more interesting connections. “12/21/2012 is the Solar Solstice and potentially the one Kabbalists refer to as 5778 (2018CE). It is Sol Invictus, the beginning of the astrological Age of Aquarius and the Mayan date 13.0.0.0.0 when the Sun symbolically passes the “X” formed by the Ecliptic and Milky Way through the “Great Rift” at 11:11UTC on 12/21/2012 to complete the Hermetic Axiom “As above, So Below”. 5778 is Phi (1.618…) to the 18th power. Phi “Golden Mean” mathematically defines Kepler’s Elliptical Orbits, the pattern formed by Galactic Spirals, musical notes (Vibrating/Oscillating Strings), burial mounds, 3-D Labyrinths, the human body and Sommerfeld’s theories on electron orbits within the Atom. Divide the number by 137=42, the number of months in the Great Tribulation which begins following the Pale Horse. The bottom line is Kabbalists and Astro-physicists have looked everywhere but the Word of God in the vain effort to become God. I feel sorry for them.” (http://removetheveil.com/god-particle/) We also see the connection to music and a vibration or hrz, labyrinths and ley lines/burial mounds. So you can see that this prophecy is based off of Bible Codes, Gematria, the earth being 6,000 years old since the time of creation and specifically the “missing 222” years that aren’t accounted for in figuring out when their false messiah comes.6000-222=5778. I suggest you read the article to get more of of what they are saying. I’m just giving you the outline of it all. So to sum up the year 5778, we see that some Rabbis are pointing to this particular year as when their false messiah comes back. This is the year of their redemption and 5779 is when their new era starts. This all makes more sense now knowing that 9/21/17 is the Jewish New Year and Jupiter (King) leaves the womb of Virgo (Virgin) three days later on 9/23/17. Does there Jewish messiah step on the scene at this time or will they show the world on who this is? Like I say before, I can only speculate on these things but a lot of it makes sense to me. Let me also add that Judaism is waiting for Elijah to come prior to this man of sin showing up. This is a prerequisite and will happen. But this isn’t the real Elijah obviously. And I can hear Christians now proclaiming that this is one of the two witnesses (which its not, that’s an entirely different study). But I would guarantee that if this all is falling into place like I’m seeing it then Jared Kushner, Trumps son-in-law will take this position. He is the one chosen to broker this false middle east peace deal (which also isn’t biblical) and Trump is using him to do this. Kushner isn’t the antichrist but he could be the inversion of Elijah to the Jews. I can see this happening. With that said I want you to read this. “The work of EliYah calls all Israelites presently waking up from the congregation of the [spiritually] dead to put these easily seen idols and their more insidious mindsets completely away. There is no room in any shape, manner or theological inventions and machinations for any gods to be added to the God of Israel. Isaiah tells us to not add other gods and saviors to the God of Israel. This was the original trap into which Israel fell: “the addition of other deities,” to “complete” and improve upon God’s plan and setup,” (Isa. 43:11, 44:6,8, 45:5, 47:8, 10). Hosea pinpoints this “dual allegiance:” “Their heart is divided; now shall they be found faulty” (Hos. 10:2). Now this same word ‘halaq’ is also used in Daniel 11:39 for the man of sin splitting up the land for gain. “Thus shall he do in the most strong holds with a strange god, whom he shall acknowledge and increase with glory: and he shall cause them to rule over many, and shall divide the land for gain.” So here you see the land being divided for gain, just as their hearts were divided. And once this happens, then there will be fault found in them. Another interesting connection to the Judges scripture with Meroz is the battle by the waters of Meggido. Judges 5:19 The kings came and fought, then fought the kings of Canaan in Taanach by the waters of Megiddo; they took no gain of money. 20 They fought from heaven; the stars in their courses fought against Sisera. Notice they took no money for gain which was referring to the angels that fought Sisera. Meroz was cursed because they did not come to the aid of the Lord against the mighty. Daniel 11:39 is saying just the opposite of what Judges is saying. The land in this case will be divided for gain. Also in Judges 5:23 they were cursed bitterly because they betrayed the Lord. “Curse ye Meroz, said the angel of the LORD, curse ye bitterly the inhabitants thereof; because they came not to the help of the LORD, to the help of the LORD against the mighty.” This is interesting because if you go on to Hosea 3-4 you see that they say they have no king because they had no fear of the Lord and they swore falsely by making a covenant which judgement sorang up as hemlock ir bitterness. I could go on but it does look like these three verses may be connected to what may take place on the future. 5777 is the year of preparation and seperation which will lead in to 5778, the false year of redemption or the year of reckoning. This will be the year that this 5778 capstone will complete the pyramid to make this perfect triangle. That’s how I am seeing it right now. We will just have to wait and use discernment to see what falls into place. Great read, the Lord woke me thus morning to seek more understanding concerning Gregorian /Hebrew calenders. Yesterday during study, I was led to Zechariah 4:7- which speaks about the headstone “Rosh” at the new temple- any corilation with the “cap stone” of 5778? I think “their” capstone they refer to is the head of Osiris on the Pyramid. I believe Zechariah is mentioning the spiritual Temple which Jesus is the corner stone and the capstone so to speak. He is the author and finisher of our Faith. The beginning and the end. The Alpha and Omega. Zechariah spoke in alot of symbolism like the book of Revelation does and as a matter of fact, you can use Zechariah to interpret the two witnesses of Rev. 11. JFB Commentary speaks about this. “7. All mountain-like obstacles (Isa 40:4; Isa 49:11 (refs2)) in Zerubbabel’sway shall be removed, so that the crowning top-stone shall be put on, and the completion of the work be acknowledged as wholly of “grace.” Antitypically, the antichristian last foe of Israel, the obstacle preventing her establishment in Palestine, about to be crushed before Messiah, is probably meant (Jer 51:25; Dan 2:34; Dan 2:44;Mat 21:44 (refs4)). bring forth the head-stone—Primarily, bring it forth from the place where it was chiselled and give it to the workmen to put on the top of the building. It was customary for chief magistrates to lay the foundation, and also the crowning top-stone (compare Ezr 3:10). Antitypically, the reference is to the time when the full number of the spiritual Church shall be completed, and also when “all Israel shall be saved” (compare Rom 11:26; Heb 11:40; Heb 12:22; Heb 12:23; Rev 7:4-9(refs5)). I see what your saying. And I agree. And this messiah be David I’m talking isn’t representing Jesus. I think that the parable of the wheat and the tears is going to happen after sundown on the 23rd of 2017 through all day Sunday the 24th until sundown. I think that’s the day that the harvesting of the field is going to take place in the Sunday churches. Everyone’s thinking rapture? Where in the heck is the story of the wheat and the tears come in? What about revival are we not going to have a great and time revival? Just in the days when the magi was led to the Christ by the star of of Bethlehem ( if you listen to Jonathan cahn it was a religion for the magi and a lot more happened then they just saw the star and started walking). Our God tells us all about the sun moon and stars and what to do pertaining to them. So that’s what I did along with guidance from the Holy Spirit and you wait-and-see if that’s not what happens! C.A. Patin, thank you so much for your posts. So few expose truth, breaks my heart honestly. Reading posts like yours, give me hope and encouragement. Thank you. I appreciate you taking the time to read it. Maybe you can help me, seeing that you seem to like the challenge of investigating things of God’s nature. Look at the three letters on my face in the fb pictures please, these came on me as I was in prayer for a healing of a double broken back. With 100% faith as the Holy Spirit had me to I prayed, then His healing heat entered my back. When it left me all the pain left with it, and I was healed, and these letters were left on my left jaw. I have witness this to several Jews, the first a Orthopedic Surgeon that did my knee surgery said to him it says our God, the second was a Spanish Jew that flew F18 Hornets with the Navy, he said as soon as he saw it it said Yahweh to him. All of the Orthodox I have shown it to say they can’t make any sense of it. Just after receiving this sign, I got a call telling me of an old family secret, that I was Jewish from my mother’s side. What got me on the path of thinking it was Hebrew in the first place, was while in bible study I went to a site that showed an old page of the Torah. It was all in Hebrew, and I can’t read Hebrew. Just as I was to hit the back arrow to the article I was reading in my study away from Torah site, the Ruach came all over me, and just said what I was looking at was what was on my face, I knew it meant the Hebrew writing on the old page of the Torah. This happen a year before the doctor told me what he did. I think me dying in Vietnam in 1972, and being in that white tunnel to heaven before being sent back to the wreckage of my helicopter that had been shot down has also something to do with all that Abba Father has been reveling to me. In my personal opinion I think these letters match more of the Aramaic Alphabet. 130/128.1 yrs. at Abraham’s birth. (See Acts Ch. 7:1-6). That’s pretty vague. What are you saying? Was Abraham really born in the year 1948? or was it not in the year 2008 ….? A simple arithmetical sum of the genealogy of the descendants of Abraham as described in Genesis will show that Terah, Abrahams father died in the year 2083. As per above, Terah was 205 when he died and Abraham was 75, so that means Terah was 130 years old when Abraham was born i.e. year 2008 and not 1948 when Then Terah was 70. This is a general statement and not meant to be read as part of the genealogical ages. If Abraham was in fact born when Terah was 70 and he lived with his father until he died at age 205 then Abraham would have been 135 years old at Terah’s death not 75 as stated in Gen12:4. The above was discovered by Anstey 100 years ago. See Anstey’s time line “The Romance of Bible Chronology’ which is solely derived from the Biblical scriptures and no other source.